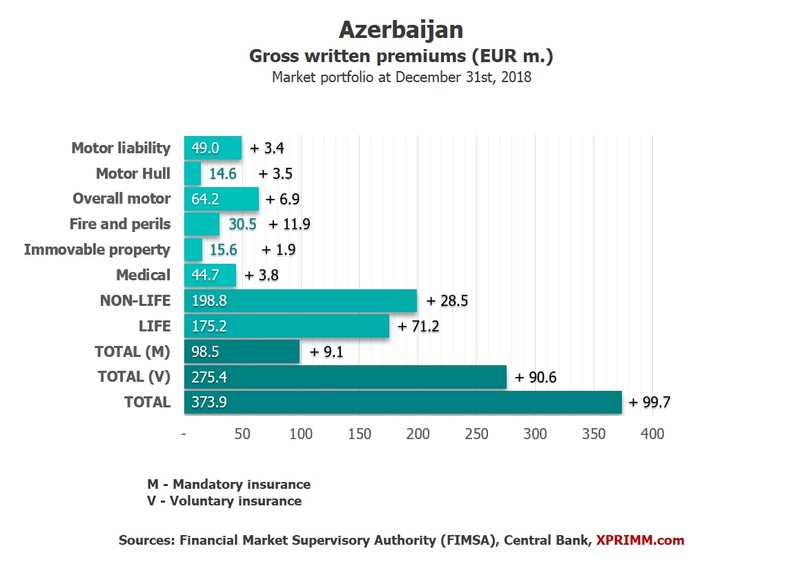 In 2018 Azeri insurers generated GWP in the amount of almost AZN 728 million (+30.7% y-o-y), data published by the Financial Market Supervisory Authority of Azerbaijan (FIMSA) show. In European currency, thanks to the Azeri Manat appreciation against Euro, the market results look much more impressive, increasing to EUR 373 million (+36.36% y-o-y growth). The market share gap between life and non-life sectors in 2018 has decreased (46.84% and 53.16% vs 37.89% and 62.11% in 2017 accordingly). That was possible due to the rapid growth of life premiums (almost +62% vs non-life premiums' growth by about 12%). In non-life sector good growth by about 43% was recorded in voluntary classes, which generated 73.7% of the total market GWP, while mandatory insurance increased by 5.6% y-o-y. Total paid claims in the national currency decreased by 6.5%, to AZN 240.3 million. The share of voluntary classes amounted to 71.8% (AZN 172.5 million), and the share of mandatory classes reached 28.2% (AZN 67.8 million). There are 21 insurance companies in Azerbaijan. The leader in terms of GWP is PASHA Hayat Sigorta (the market share is 36.4%), second goes PASHA Sigorta, the share of which decreased from 19.32% to 17.58%, however, together these two leaders control over 50% of the market volume. Among TOP-5 insurers the most impressive growth rate was demonstrated by ATESGAH Hayat (+56.65%), while its paid claims dropped by 73.26%. Access www.xprimm.com and download FY2018 Azerbaijan insurance market statistics.